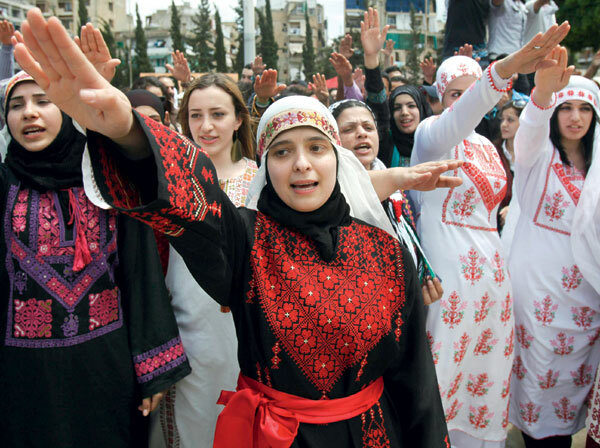 Palestinian women wearing traditional dresses salute as they sing the national anthem during a festival to commemorate Nakba in Beirut yesterday. Palestinians will mark “Nakba” on May 15 to commemorate the expulsion or fleeing of some 700, 000 Palestinians from their homes in the war that led to the founding of Israel in 1948. This entry was posted in diaspora, Lebanon, Palestine, right of return, Right to return and tagged Lebanon, Nakba, Palestine, right to return. Bookmark the permalink.